This iExpression links an arbitrary property to a slider (or some other 1D property - like audio keyframes). The link is such that the slider controls a time remapping of the property. You specify which frame corresponds to the minimum value of the slider and which one to its maximum value. 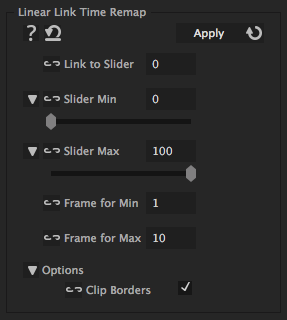 For all other slider values the iExpression chooses automatically an appropriate frame (using linear interpolation). If this option is enabled, the property will always take values from the range of frames from 'Frame for Min' to 'Frame for Max', even if the slider it is linked to has values smaller than 'Slider Min' or larger than 'Slider Max'.